Our annual holiday pilgrimage to the Midwest was exhilarating. And exhausting. And I mean that in the best possible way. We drove all over to see family and friends. And lucky for us, Lilla is a professional car sleeper. Seriously, five minutes into every drive, she was in toddler la la land. 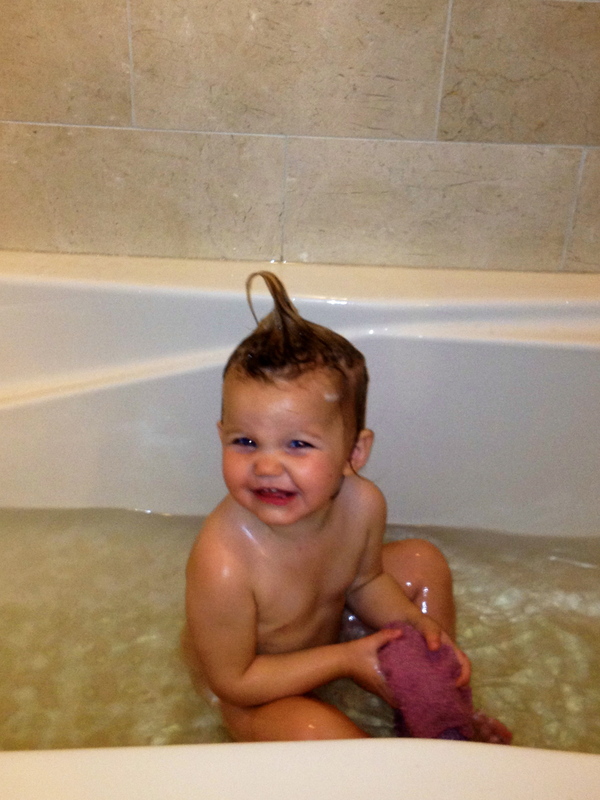 Thanks to a little help from her “pa pa” (pacifier). Lilla definitely loved Christmas a lot more this year. And that’s probably because she could walk and talk and eat “cooooookies.” So it was a lot of fun to watch her experience it all. She wasn’t as into gift opening as I thought she would be. But I’m sure that will come next year. Her maternal side made its official debut. The burping, crying, bottle sucking baby she got was one of her favorite gifts. She wouldn’t let it out of her sight. She also discovered snow “Cooollllddd” for the first time. And became an expert at climbing up and down Grandma and Grandpa Rodgers’ stairs in their new lake home. And speaking of stairs. The finale of our trip had a little something to do with them. This year we stayed in Chicago for New Years Eve. 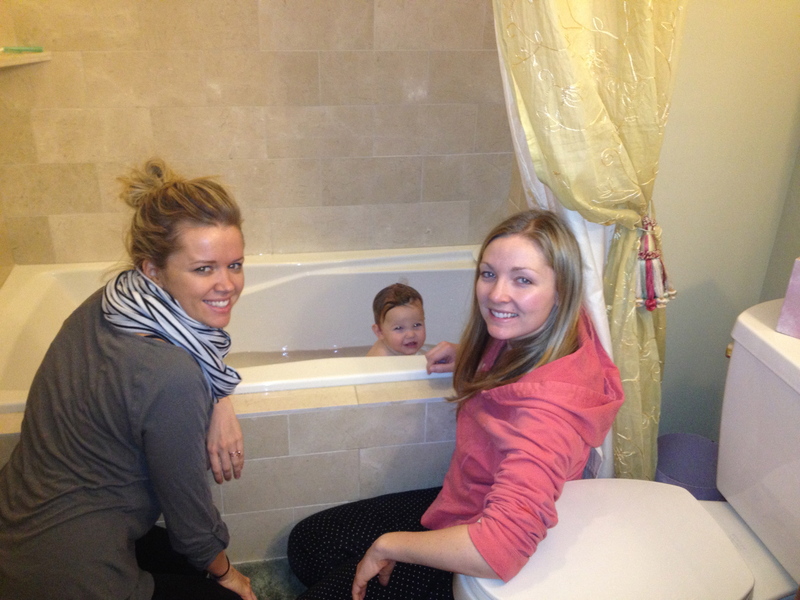 We wanted to go out with our friends and had the opportunity to cash in on some free babysitters. And when you have that golden opportunity, you never turn it down (thanks Dad & Nance!). So Jon and I kissed our little Lilla Bean goodbye as we ventured out for dinner and drinks in Chicago’s Greek Town. Eight hours and countless glasses of wine later, we arrived back to my Dad and Nancy’s condo at 4am. Clearly someone forgot to tell us we’re in our thirties and have a kid. After Jon whipped up some late night chocolate chip pancakes, we got some shut eye. Next thing I know, it’s 8am and I’m awoken to Miss Lilla saying “Mommy Mommy Mommy….cheers!” which was quickly followed by clinking of what sounded like champagne flutes. But how could that be? I just assumed I was dreaming and continued to keep my eyes closed. And then it happened again. Poking this time and then “Mommy Mommy Mommy…cheers!” and then clink clink clink. So I opened my eyes, to find that our little 17-month old nugget had escaped her pack n’ play and was in fact banging together 5lb Waterford Crystal champagne flutes. So I did what any parent with the world’s worst hangover would do. I took the flutes, placed them on the nightstand, picked up Lilla, brought her into bed with us and told her to go “night night”. Oh if only that would’ve worked. A good 30 seconds later she decided the whole sleeping-in-bed thing was a terrible idea and quickly wanted “doooown.” Seeing that she was the only one up and Jon was barely moving, I forced myself to get up. And that’s when it really hit me. A. Holy headache. B. She crawled out of her pack n’ play. C. Holy headache. D. Where’d she get champagne flutes? E. Holy headache. Fast forward a couple of hours and we had some answers. And in order to tell them, first I have to set the stage of the setup of my Dad and stepmom’s condo. It’s two stories and our little guest wing was downstairs from everyone else. Simply put, the only way out of the condo was to go up the stairs from where we were staying. Once Nancy was awake, I asked her why her and my Dad would have left crystal champagne flutes out where Lilla could grab them. Her response? Uh, they didn’t. Nope, after putting Lilla down for bed, they decided to have a little New Year’s toast of their own (and why wouldn’t they?) in their family room, where they left the champagne flutes on the coffee table. Let that sink in for a minute. So after I picked up my jaw from off the floor, I put it all together. Lilla crawled out of her pack n’ play (at God only knows what time), climbed up the stairs, grabbed two 5lb champagne flutes, crawled back down the stairs and clinked them together next to my head. So yea, needless to say, we win the parents of the year award. And the cherry on top of this wonderful debacle? We had to fly home a few hours later. Home as in San Francisco. Lucky for us, Lilla’s also a professional airplane sleeper. 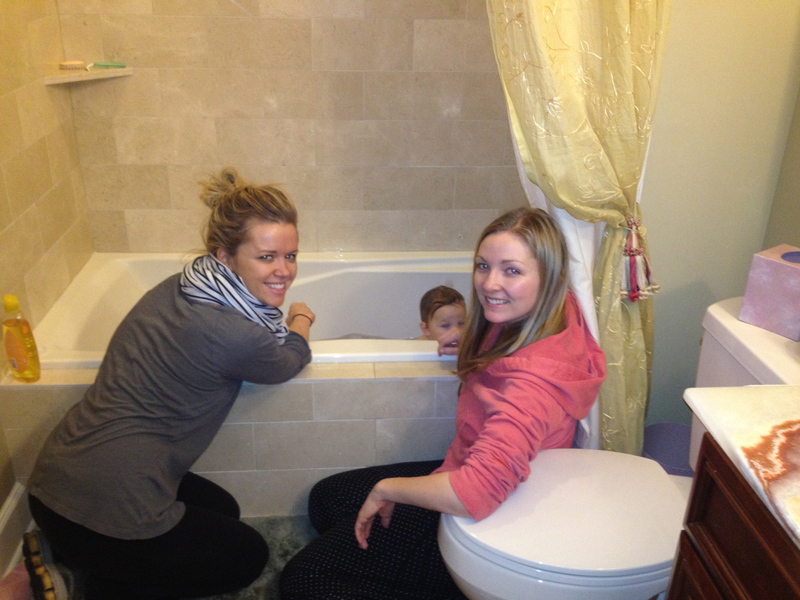 The pics are from the morning after when L’s two aunts Lindsay and Kirby were a Godsend and gave her a bath.